Are you confused now? Many of you are aware of the hoopla in the fermenting world concerning mason jars and anaerobic environments. My timing of a review of the Pickl-It jars just happened to fall in the middle of it all. If you aren’t aware, you can see some of what is going on here: Lactic Acid Bacteria and the Lowly Mason Jar from Cooking Traditional Foods, We’ve Had it All Wrong from Delicious Obsessions and a response from a few big names in the fermenting world (including Sandor Katz, swoon) Are Mason Jar Ferments Safe? from Food Renegade. Where do I stand? Here is what it comes down to for me. KerryAnn isn’t just stating her opinion, it’s scientifically proven. She is now taking a lot of flack for putting the information out there. Is she forcing us to change? No. Of course not. But how can we make informed decisions about our health if we don’t know. The problem comes when people who are hoping to find healing through foods hit a wall and don’t get better. It happens a lot. Many people just give up because they didn’t get better. Some even get worse when they introduce fermented foods and we call it “die off”. Maybe it’s not die off, maybe it’s a reaction to a small amount of bad bacteria. People who are seeing good changes when adding fermented foods could get better faster if they fermented the “right” way. Instead of shelling out money every month for probiotics in a pill, they could just eat fermented foods. Food fermented in a truly anaerobic environment should have as much if not more probiotics than a pill. There is no refuting that fermentation needs an anaerobic environment. The question is how to obtain that. I do think open air fermentation is risky to consume and don’t recommend it, especially if you are dealing with gut issues. 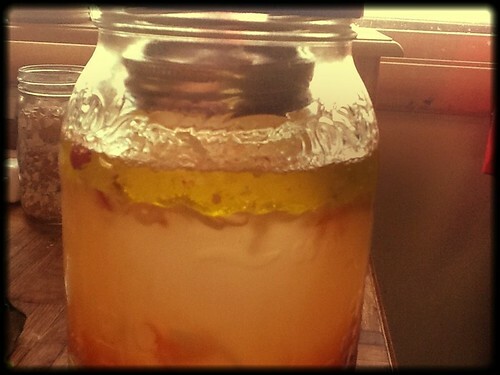 Burping a mason jar is obviously not anaerobic but if the food is submerged under a brine, it might not be bad. In the almost 7 years I’ve been fermenting, I’ve only had one batch go bad and that was with using a sub par airlock system too, lol! I do refute the idea that veggies under brine are in an anaerobic environment. Air exchange does happen on the surface of the water and through diffusion, it mixes in the water to the ferment. Not a lot but enough to make a difference. KerryAnn addressed this issue here: But I Thought It Was Anaerobic As Long As It Was Under the Brine?!? What I did here was pack the curtido in my 1/2 gallon jar, weighed it down with a smaller jar full of water, added a few inches of salt brine and then a generous layer of olive oil. So far it looks beautiful. All the pieces that did float up to the top of the brine (has anyone ever been able to keep all of it down anyway?) are still under the oil layer. The oil seals the top, bubbles can escape but no oxygen can get it. Voila, anaerobic environment. If you do this, do it in a large enough jar to allow for expanding. Sauerkraut gets happy fast and will begin to push up. You might need to add more oil as it gets more active to keep everything airtight. Mine has been going for a few days now and is past the super active stage. The layer of brine under the oil helps keep any food from poking through the layer of oil. Both the brine layer and the oil layer should be pretty thick. Day 3, lots of activity. Bubbles rising through the oil. Once this kraut is done, I still need to address storing it. Once fermentation is complete, you’ll want to keep the ferment in an airtight container. This jar will go in the fridge for a few weeks as is. 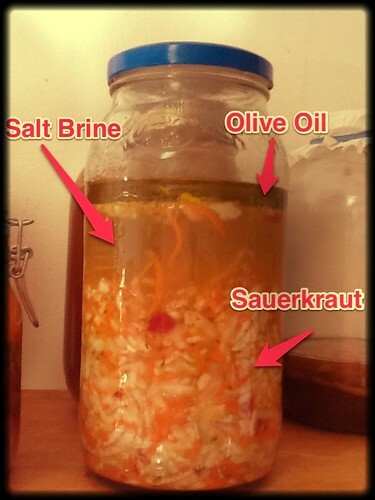 When the activity has completely died down, I’ll remove the oil layer and transfer the kraut to a Fido jar. Honestly, I’ll still take my Pickl-It Jars (and one day I’ll get a Harsch) and forego the oil layer but this looks like it would be a very good option for those who just can’t or don’t want to purchase a Pickl-It jar or Harsch crock. For the long term fermenter, you still might save money with a Pickl-It over time since using enough oil to make this work will add up fairly quickly. Will this work for all ferments? I wouldn’t add oil to my dairy ferments or water kefir but that’s all I can think of right now. My mother cultures (pure cultures of yogurt made with pasteurized milk that I use to inoculate my raw yogurts) I will only make in a Pickl-It jar from now on to ensure the culture stays pure. I’m less concerned with my raw dairy yogurts being cultured in an anaerobic environment since I’ve never had a bad experience. We eat a lot of yogurt and I only have so many jars. I’m sticking with my good, better, best scale. I’m not sure exactly where adding an oil layer stands since I don’t have lab tests to back it up but my best guess would put it as better or maybe even best. Good: Fermenting under a brine. Better: Mason jar airlock system. Best: Pickl-It or Harsch, oil layer over the top of the brine. **I am not affiliated with Pickl-It. Just a happy customer. Great post, Melanie! I think the oil idea is a great option. How do you remove the oil when your ready to eat it? As long as it has a decent gasket, I think those kind of systems do pretty well. Threaded lids can’t get 100% air tight but it is much better than not having an airlock at all. The oil should harden once you place the jar in the fridge. When it’s solid you should be able to just “scrape” it off. I also read that traditionally egg whites were used to cover the ferments. they allow carbon dioxide to get out, but not the oxygen to get in. My big thing is with kraut you have to really be sure to get all the oxygen bubbles out of the stuff before you secure it under the brine. Ever notice that, like the brine doesn’t situate itself fully throughout and there are little air pockets. From what I understand, you want to get as much oxygen (bubbles) out as you can but during the first stage of the fermentation process, the oxygen should get used up. As I’m watching my sauerkraut, the off gases do escape easily through the oil layer and there is a layer of bubbles on top of the oil. I’m planning on doing a follow up post, hopefully tomorrow. The egg white thing is interesting. I’d be worried that the egg whites themselves could be a breeding ground for funk. I’ll be interested to hear your results. Here’s a thought, so using the oil as a barrier to protect the ferment and keep it anaerobic during the intial on the counter ferment – that I get, but then how do you figure when you put it in the fridge and it’s still fermenting if your fridge is above 40 degrees and you are then eating out of it – obviously you have to get rid of the oil to eat it, but then do you put oil back every time? or do you just eat your food up quickly. Also, do you ferment large quantities of anything during the summer to then store? I am looking for solutions on how to go about this the best way – I have a cold cellar but I don’t think it gets cold enough to store my ferments, so I plan to get an old smaller used fridge off Craig’s List and set it to the right temp and use it just for ferments. I don’t want to waste my ferments so I am trying to weigh the best method that is both feasible and affordable along with safe. Any thoughts? I’m hoping to clean up my cellar soon and use it for storing ferments. I do have a second fridge but with a family of 6 (4 hungry boys) but I still don’t have enough room for all the ferments I want. With sauerkraut, I think it gets better with time. I keep it at room temp until it’s not visibly active anymore and then I move it to the fridge to finish it off. I’ll keep it there with the oil on top for a few more weeks. The hard part about this method is it’s difficult to taste test it. Whether it’s ready or not taste wise, I’ll remove the oil and repack it in a flip top container like a Fido jar. At least that is my plan. So far I’ve only done small batches of ferments here and there. This summer though, the boys and I are helping out at a local organic farm and they are paying us in veggies. Woohoo! I’m hoping to put up enough veggies to get through the winter until the next growing season. I had to throw out 4 quarts of pickled pea pods this week that went bad. I’m hoping to avoid that by utilizing an air tight system which right now is looking like Pickl-It jars and a Harsch. Even though it’s a lot of upfront cost, I think it will pay for itself in the long run. Yay! Moms of boys are a special breed. I may invest in some Fido jars – they are a decent price! My dad is growing a huge family garden this year. He is doing 90% of the labor, I’ll help as I can, my oldest son goes over and helps out on the weekends. But it will be my job to do the storing of the harvest. So I am gearing up and planning how to do it well. It would be SO great to have all my own vegetables to use through the winter (except for some things like onions, garlic, carrots, celery….etc). I need to make sure I’ve got this fermenting thing all figured out by then! I did pickles last year in mason jars and they lasted all winter just fine. I did have one jar with some pickles that froze, and one that they got mushy. I think I’ll transfer my pickles to Fido jars for optimal storage, and get a thermostat for the front and back of the fridge to make sure it stays at a consistent good temp. Actually not all ferments need an anaerobic environment. I.e Jun and things like Natto. Even the ones that do require zero oxygen. even when fermenting something like sauerkraut some of the organisms do require a small amount of oxygen they are called Microaerophiles, they also require carbon dioxide in greater concentrations. This co2 is abundant enough and has enough levity to expel the fractions of oxygen that are superfluous. I think kilner jars are a better choice than mason jars as mason jars have metalic lids which in my opinion is a bit risky when considering lactic acid and acetic acid are very corrosive and if they come into contact with metal are likely to leach these into the food. Hi Melanie: Great site! Above you said: “What I did here was pack the curtido in my 1/2 gallon jar, weighed it down with a smaller jar full of water.” I don’t see the “smaller jar” or understand the concept. Could you elaborate. Also, I have a Harsch Crock, and have made sauer kraut in it, but don’t see how that is an anaerobic system (it has a weighted round brick and a lid); you do keep water around the outside of the lid to seal it but must periodically open the lid to check on the process which would introduce air. Maybe I have a different kind of Harsch or need to read the directions again. I didn’t find any info on your site. Have you written about that? Thanks! Hi, so when you put the oil on top of the brine layer, it will still expand? I’ve been thinking I did it wrong because it expanded and I had to pack it down anyway, but now I’m thinking maybe that’s just the CO2 building up and it’s OK? In that one, it is clear that there are no microbes which break down cellulose in there. But there should be. Maybe they are yeasts? She also vilifies molds, yet yeast is the same thing as mold. And people take saccharomycetes cervicae var boulardii as a probiotic supplement, that’s the yeast often found on bruised fruits and also on grapes naturally. You can google it or look for it on pubmed. Maybe people prefer crunchy kraut because it is more aesthetically pleasing. But the point of eating ferments is exactly the exercise of activating your immune system in a controlled and safe manner. If you have gut problems, then sure, start with the anaerobic ferments, but make a batch in an open crock and take tiny amounts of it. The point is to train your system to be able to tell friend from foe, and to tolerate the benign microbes. You can’t train it with something limited. The reason people used anaerobic bacteria was because they had no refrigerators. They used every method of sealing out air (waxed cloths crimped under th lid, paraffin poured onto the top – btw, Sandor Katz does mention this, and even oil as used here, or tallow that would harden)… for the purpose of preserving their food for the lean time (winter and spring). It was vital that only anaerobic bacteria be used in the olden days because otherwise you had no ferments in February, because they’d all gone bad. But if your purpose is to retrain your gut to stand down from a constant state of alarm, then a little chaos may be called for. Not much chaos, just a little bit. Crud. I guess I should’ve closed the /a tag. Darn HTML tags anyway.